Submitted photos Country Kids 4H Clover Buds members with their certificates of appreciation (left to right): Elaina Moore; Conner Glass; Corey Stone; Trevor Moore; Kyleigh Evans; Matthew Church; Jimmie Church and Gracie Barron. 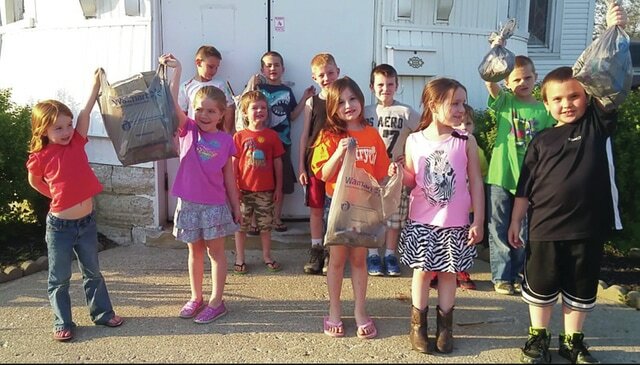 Members of the Country Kids 4H Clover Buds collected trash in Jamestown. JAMESTOWN – Members of the Country Kids 4H Clover Buds received certificates of appreciation for their work in a community service project. The 4H members walked the streets and collected trash, living out the 4H pledge by providing their “hands to larger service” for their community. Advisor Sarah Stone-Glass taught the importance of keeping the community clean, along with recycling and safety. Jamestown Police Chief Rodger Tyree presented the 4H members with their certificates.